For the past few decades, society has been going on a health bandwagon from reducing cholesterol to strict calorie intake. Whether it was for physical reasons of improving body health or personal reasons of sculpting the perfect body, the world continues to look for healthy alternatives in life. Enter the nifty appliance, juicers. Surprisingly, the first evidence of the concept of juicing was documented from 150 B.C. to 70 A.D. but did not become more popular or available until the 1990’s. In a weird way, juicing is a fairly new trend in the health world although everyone has heard about it. The benefits of juicing have been no less than interesting. In fact, they have compelled many people! Are you one of the many people interested in purchasing their first juicer or perhaps looking to find a new and improved one? Look no further! We are here to help you out. We are happy to go over the top 10 picks of likely juicers that should belong in your kitchen. Not only would you be able to see both the beauty and flaws of each product but we also took the liberty to share with you which juicer took first place and why! Without further ado, let’s look at some of the top juicers we will be covering over for this year’s best juicer machine! We understand that being serious about juicing will heavily rely on the juicer you have. There are a lot of qualities to consider when sealing the deal on a juicer of your choice. Likewise, there are a lot of juicers claiming to meet everything on your checklist. Let Have a Look on the Promising Candidates. The first juicer we are going to look at is the Hamilton Beach 6760A Big Mouth Juicer. Hamilton Beach is a popular vendor who sells numerous kitchen appliances and products. This product happens to be in the dominating family of juicers sold by them. The Big Mouth selection is considered a “best buy” from them because it has all of the characteristics Hamilton Beach products are expected to encompass. Juicer lines do not make the selling shelf unless they meet the standards of reliable efficiency, easy cleaning, and speedy operation along with possessing other high-end features. Save time when making delicious juices with a powerful 800-watt motor that can cut through products in no time. Enjoy longer juicing thanks to an extra-large pulp bin. Minimize time and effort used during pre-cutting with a large, round chute. Your juices can be stored in a variety of containers or glasses because of an excellent spout funnels. Prep time can be reduced even more with an extra-wide shoot that can handle whole fruits and vegetables. Some customers have experienced the blade plastic bottom melting due to the intense speeds of the metal blade. There loud juicing process is inconvenient for small talking spaces or during quiet times. Mistakenly not fitting the parts and pieces perfectly could result in bubbles from the side of the juicer. Some juicing situations may yield a wet pulp that would require an additional run through or two to get extra juice. You could see this as the best juicer under 50 dollars because of its proficiency and affordability for low budgets. Sure, you could purchase another evolved model for more bells and whistles but is it worth it for the price jump? Overall, this juicer gets the job done but can possibly show some flaws. The next in our list of top candidates is Hamilton Beach merchandise too. This juicer happens to be a discontinued product. However, you can still find it for sale online. You may feel unsure about purchasing a discontinued product but the juicer’s creditability has recently been supported in a leading gourmet magazine with an earned rating of “Most Efficient”. This is no surprise considering its impressive attributes put it as one of the top juicers! A feature that can help you optimize your yield is a bin that permits you to add nutrient-rich pulp to your juice. That’s not all! Dishwasher safe for convenient cleaning purposes. The stainless steel design stylishly fits any modern or special kitchen theme. You can juice even the toughest of produce with the 1.1 horsepower motor. Juice as much as you want with the help the double serving pitcher that is able to hold 20 oz of juice. Uniquely designed for easy storage, assembly, and handling. Despite cutting ingredients to a small size, the engine could jam. Along with a loud noise, your juicer may vibrate on the counter while in use. Since this product is discontinued, finding replacement parts could be challenging without buying a whole new one. Juice pulp might find its way in all crevices after each use. Not only does this juicer come from one of the best juicer brands but it proves why it deserves to make the spot as one of the best juicers on the market. This juicer will be really useful when needing to extract harder to juice produce in a fast amount of time. Although there are a few things to look out for, we can appreciate its hardiness to bring juicing delights to you! Up next, Breville presents you a product that you may feel can be the best juicer under 100 dollars once you read a little more about it. 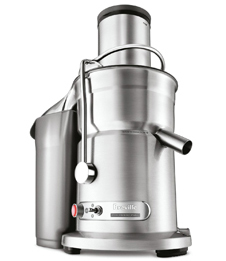 Breville is highly known for delivering commercial-quality juicers and other food preparing products. The BJE200XL Compact Juice Fountain is no exception! You can find both quality and durability with this juicer. Sometimes, it’s hard to get rid the most out of your product while conserving space. Breville’s juicer addresses this by conveniently placing the pulp collecting portion inside the unit’s footprint for conserving the space on your counter top. However, that’s not all! Extraction hits a maximum performance with a powerful motor that runs at 14,000 RPMs. A centered knife blade assembly contributes to the juicer’s heavy-duty, compact characteristic. Overall, the total juicing performance is enhanced with a micro-mesh filter made of stainless-steel and a 3-inch centered feed tube. Save time on cleaning because of juicer parts that are dishwasher-safe. A molded loop makes plugging and unplugging simple and easy. Small fruits tend to fling out during juicing. Cleaning can prove difficult with the base of the wire mesh basket. Leaking messes can come sooner than expected after not being used for very long. Like all things you buy, these juicers may have some downfalls. However, its special features for boosting its performance are terrific qualities. The simplistic design makes it easy to get a juice ready in a timely manner for your busy morning schedule. As long as leaking does not happen, you can expect to use this juicer for a long run. The key is to follow directions when using it and remain diligent in cleaning after every use. Have you ever had one of those days where time kept slipping through your fingers and needed to catch a break somewhere? 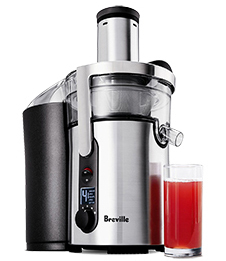 This Breville juicer gives you the break you deserve with quality characteristics! You can save all the time you need while juicing because of the cutting disc, made of stainless-steel, which provides incredible speed results. So far having the list’s strongest motor, your fruits and veggies will quickly be extracted from juice with a dual-speed motor that is exceptionally powerful. This great feature is just one of those benefits you will get if you choose to have this blender as your new juicer partner. Supports a complimentary 1-liter juice jug that has a froth separator. Assists you by providing overload protection LED and a safety locking arm. You can incredibly produce enough juice to fill an 8oz cup in only 5 seconds. The micro mesh filter, Italian made, extracts not only 30% more juice but also squeezes out 40% more vitamins and minerals too. There is a large collector for enhanced pulp collecting, in case if you wanted to make a big juice cup or reuse the pulp. A wet pulp may call of repeating the juicing steps multiple times. Large fruit and vegetable pieces seem to find their way either out of the juicer or on the side of the discharge bin. The top plastic portion can experience a breakage when you have to pull the metal bar of it. Leaks can be due to vegetables like celery clogging the blade basket mesh. Although product blemishes can be worrisome, you should determine if the pros weigh out the cons. Do take this into consideration that the durability is enforced with a polymer body. If you happen to be someone who hates seeing power cords stretched out across the countertop, you may appreciate the feet and clips under the base that provide the option of wrapping the cord. Finally, you will be able to experience juicing at a high-quality level without having to exceed over entry-level price. It might be the best juicer on the market for you! 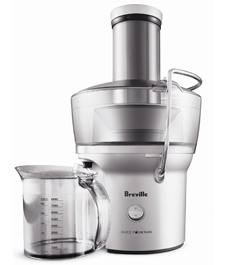 Next on the list is another Breville juicer that gives a few extra buttons to push for a variety of choices. Aside from the buttons, there are quite a few perks this product can offer you. First, a Nutri Disc that has reinforced titanium cutting blades, stays sharper for a long span of time for amplifying the longevity of its life. Have you ever shuttered away from the screeching sound a juicer can make while cutting and extracting produce? The BJE510XL keeps you from experiencing this with a noise and vibration control that is focused on the chute, centered on the Nutri Disc to minimize disturbances. Take a look at some other things you can experience with this juicer. You can enjoy 5-speed settings for optimal juice yield varying on the type of produce yield. Maximum extraction with an impressive 900-watt motor. A stainless-steel appearance facilitates a fashionable design for any kitchen. A backlit control panel helps you to properly see your juicer’s functions for easy use. Effortlessly create a healthy drink with the convenient detachable spout along with a juice jug and froth separator. There have been complaints of individual parts being on back order for long periods of time when needing to be replaced. It is not unheard of to experience the motor short circuiting or frying after a few uses. The filter basket may be one of the first things needing to be replaced as clogging becomes common and harder to control, resulting with wet pulp. Sometimes the power will show but the juicer won’t turn on. Leaking can be experienced down the back when it leaks from the handle bar at the top and dribbling between the lid and collar. Sometimes bells and whistles are not everything but you can enjoy the extra comforts available for juicing with this product! Are you the type of person who likes your products to be able to perform more than the standard function? If you are, you might fell in love with this next juicer! 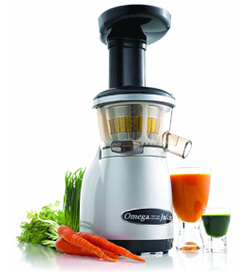 The Omega J8004 is designed to perform more than just the expected juice extraction. It has multiple purposes that include making nut butter, baby food, soy milk and much more. This juicer is able to be a handy kitchen helper to assist you in numerous processes that could potentially take more time and energy. The material is comprised of GE Ultem Auger which is impressively eight times strong than plastics. The power of the gear reduction is equivalent to a powerful 2HP motor. These qualities are not the only characteristics this juicer has! A lower speed approach to the number of RPMs ensures the minimizing of clogging, juice foaming, or build-up of heat. An auto pulp-ejection facilitates the continuous operation for a high yield with dry pulp. The lower speed levels not only help to maximize the number of nutrients and antioxidants extracted but they also do not take longer for the juicer to perform. Unlike other juicers, this product prevents juice separation or degradation which allows you to store your juice for up to 72 hours. Many masticating juicer reviews testify to the durability and reliability of the product. Some customers have experienced the cone cracking while it heats up with the nuts to make nut butter which could result in plastic pieces breaking off. Prep time can be longer than desired because the feed tube is on the smaller side. Squishy fruits can be troublesome which is problematic if you want to produce juice of strawberries, pineapples and so on. Unlucky users have experienced unexplainable smoke after assembly. Filter dilemmas may result in producing a sauce instead of a juice. 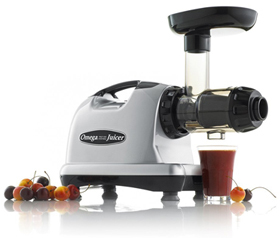 If you experience an unfortunate situation of needing parts replaced, take comfort in that there has not been a common complaint of Omega juicer replacement parts taking a while like other juicer brands. 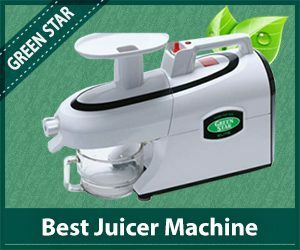 Our next best juicer machine is one of the best in the market as it gives a high-class performance and gourmet juicing results. The interesting attribute of Omega is that the juicers are designed with a vertical stainless steel basket that influences the consistent spinning of juice from pulp for a silky and smooth drink. Omega also ensures that the speed selections for the masticating style juicers keep enzymes important for health intact during the juicing process. 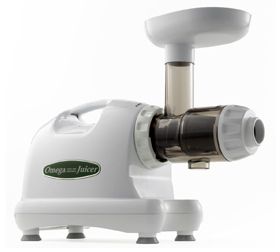 Just so you know, Omega is the only market company that offers masticating style juicers. This only helps make the juicer’s price worth the extra pennies. 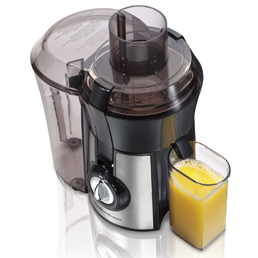 Omega’s J8006 Nutrition Center Juicer model has plenty of helpful features to get your juicing morning started! Produce is squeezed instead of grinds that promote natural taste, pure color, vitamins, and nutrients because of a masticating style. It is dual staged, supporting functions like crushing then squeezing for higher juice yield and pulp dryness. The efficiency and productivity of the juicer will economically help you as it can get the most amount of juice of the least amount of produce. Foam preventing oxidation is limited with the slower 80 RPM system. Like the other Omega juicers, juice from this beast can be stored for up to 72 hours. Response times for replacement or repair for this Omega product have reportedly been painfully long. Unfortunately, customers have experienced the cone cracking not too long after assembly. Wheatgrass seems to be a tricky produce for the machine to juice. The feed chute is about half the size of other juicers. It might be a little scary in dishing out wads of cash for a product that could display troubling behaviors but considering its limited manufacturing choices and strong list of pros, you will be able to appreciate the juicing appliance! Our next featured juicer really packs a punch with its 2-speed controls! It’s its power and control that helps lands it at the top of the most promising juicers. You can juice with a high 13,000 RPM or low 6,500 RPM speed settings. Following the consistent theme of Breville products, the 800JEXL can help speed up your morning routine with easy use and clean that can be done with the dishwasher. Apart from that, the juicing process itself is very quick to keep you from waiting. The locking arm snugly fits the machine as the bolts can move to ¼ in every direction. You can fit large fruits, vegetables, or produce chunks into the extra-wide feed chute for cutting down on preparation time. The die-cast materials produce not only beauty but operational durability too. A maximum amount of juice can be extracted from a direct central feed system that is patented. Unlike juicing systems that introduce ingredients on the shredding disc’s side, this juicer centers the chute directly over the disc for more efficient results. After about a year of use, it wouldn’t be surprising to find the pulp becoming wetter and wetter. It does not seem like this juicer will last for many years to come as you are more likely to experience leaking juice and propelling vegetable debris after a few years of use. It has been reported to produce about ¼ less amount of juice when compared to other brands like Omega. There is a high chance that customer service for the juicer is going to let you down if not test your patience. There is always a risk to take when buying a new product but we can appreciate this juicer’s ability to make quality juices aimed at supporting your health! Can you picture having a skilled person in your kitchen making your freshly juiced drink for you? You don’t have to imagine hard since all you need is the Omega VRT 350 Heave Duty juicer for that. This juicer can be your right-hand man in your home for your daily juicing activities. We can appreciate that the juicer is versatile, easy to use, and saves you money by not requiring the most amount of vegetables and fruits in order to juice out the best yield possible. The vertical footprint makes the machine itself more compactable for your kitchen space. Of course, it can meet standard expectations of 72-hour juice storage and dual stage processing systems. However, the juicer has a few extra perks that help it stand out! The 3 setting capability allows you to have the option of reverse that addresses ingredients that get stuck or clogged. An over-size spot allows your juicing creation to freely flow into cups for easy drink serving. It is easy to clean in between different drinks as pouring water into the chute can self-clean the juicer to accommodate changing ingredients. It can accommodate a pusher to help you push ingredients into the machine without having to stick your fingers in it. The easy to use parts make the product instructions useless. Despite the reverse setting, the spout can become clogged so you have to keep your eye out for that. If you find pulp slipping into your juice, you will have to use a strainer to remove the pulp and waste some of your time. Although a decent size, the feed tube may make you have to cut your produce into smaller pieces. Greens have a tendency to possibly clog the expel shoot which is narrow and lead to the juice expelling to become backed up. The two-part assembly will have you juicing in no time! Finally, a feature highly valuable is its ability to feed the ingredients itself so you do not have to stand over it and monitor. To finish our list, we would like to present not only the best juicer of 2017 arguably but the best cold pressed juicer as well. Tribest has a reputation of providing the latest developments in natural health around the world. The Green Star Elite juicer extractor is one of Tribest’s most renowned products. Incredibly, this juicer is claimed to reputably be the finest juicer in the world! 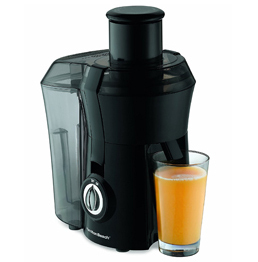 It encompasses the latest juicing innovations while sporting an attractive modern appeal. You can purchase the GSE-5000 in sharply elegant colors like white, chrome, and black. Aside from its good looks, you can enjoy immense benefits from choosing this product as your one and only juicer. Easy cleanup and continuous juicing with an automatic pulp ejection. Not limiting itself to juice alone, the machine can produce other delectable foods like sorbets, nut butter, and healthy baby foods. For optimal convenience, you are able to pressure adjust without having to stop the juicing process so you can juice a variety of produce in one session. It can imitate the human mastication system with twin gears that have special points. You can easily haul this juicer around to parties and gatherings since a balanced sure-grip handle makes it easily portable. The finer parts of the juicer contribute to the overall appliance weighing a bit heavy. Sometimes produce has to be pushed down in order to get through the mechanisms. Some operational inconsistency can be frustrating, especially with turning on and off. Reports of some units having a loud grinding noise have been made. If you are experiencing issues with this juicer, customer support is usually good about fixing the problem as soon as possible. Overall, this juicer is truly astonishing and deserves a spot at the top of the list! Juicing is an excellent way to start making healthy life choices and effectively intake all of the good nutrients you need. This importance makes choosing the right juicer essential. Before making your choice, there are things you should consider. 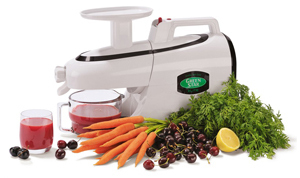 You are going to need a juicer that is durable and can handle a variety of produce. Although time-saving is a good attribute to have, it should not take away from the quality of the resulting juice. A good juicer should be able to provide conveniences of easy assembly, use, and clean up. If it can’t separate the pulp from the juice, what’s the point in having it? Well, all of the juicers on the list have proven why they should be considered the best of the best. However, one of them stood along and came out on top. The top pick for the best juicer machine is the Tribest Green Star Elite GSE-5000 Jumbo Twin Gear Cold Press Juice Extractor! It can offer you so much more that what was already described! The unit has a nylon safety buffer placed between gears that are crucial for ensuring the two gears do not come in contact with one another. Extracted juice can provide higher nutritional content because of the one of a kind magnetic and bioceramic technology. Another great feature is that most juicers only focus on crushing functions while the Tribest GSE-5000 juicer can both slice and cut ingredients. Concentrations of this juicer’s finished product are between 50% and 200% higher than products of other juicers! It is reliable and can be expected to service your juicing needs for a long time. Although the entire juicing and cleaning process can take longer than competing juicers, it is well worth the wait! You will get the maximum amount of nutrients, without the hassle, in a delicious drink you can enjoy over and over again! Do yourself a favor and make sure you spend your money wisely. It’s great to wake up to a morning where you know you get to start off your morning by getting a boost of energy from a healthy, tasty drink made fresh from your terrific juicer! Hey Edna, which juicer machine would you suggest for a single mom with two kids of age not more than 12. I really want them to have home made fresh juices without any preservatives. Not to mention that I’m low on space in my kitchen and don’t even need a product that gives too much noise. So I want a compact juicer that works really fine. How about Hamilton 67608? Jenny I think you should go for Breville BJE200XL. 1. It’s not that much expensive. 3. Extracts the most out of the fruits. Hamilton isn’t a bad choice either but it could produce some unwanted noise while usage. i have limited budget of 60-70 dollars can you please suggest me one under that please? Hi, Parth! Hamilton Beach 67601 is the best option then. You can buy this only in $49 🙂 Happy juicing! Juicers make juice that is not only good for you, but they are also relatively easy to use. Most juicers are equipped with a feed shoot, and the process is quite simple. All you need to do is start the motor and feed the fruits and vegetables into the chute pressing them down with the pusher that is provided. i have limited budget of 100 dollars can you please suggest me ? Hi, Saphony! 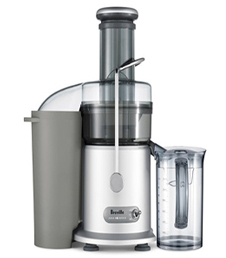 Breville BJE200XL is the best selling juicer machine you can buy under $100. I really love number 1, the Hamilton Beach Smoothie Maker. Glad you liked the review Andy.